In 2013 I had the opportunity to visit the MIT MediaLab. 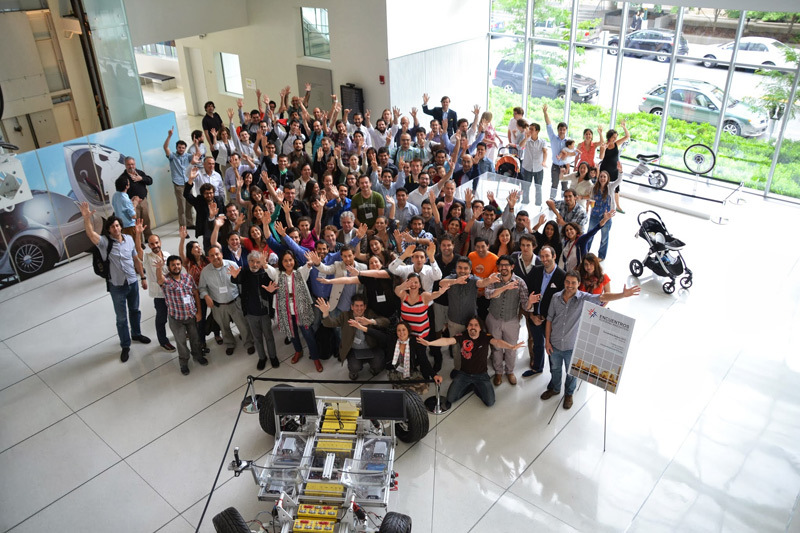 I was lucky, because I was doing a “half-gap-year” and during my stay in Boston, a lot of chileans gather at MIT Media Lab. I just had to join them. It was pure luck. I was there at the right time at the right place. The gathering was called Encuentros2013. During the meeting I was amazed, and disappointed. I was amazed because all of the great people you could find there: Humberto Maturana, who was more philosophical and human than I expected; Francisca Valenzuela, famous singer who was incredible friendly (I had to bought her song Salvador); Alfredo Zolezzi, which happily is trying to give low-cost-clean water wherever is needed; and a guy called Cesar Hidalgo who gave soul to the place (this guy remind me of “El Quijote”). All of these people were just great. The theme of Encuentros2013 was “Inspiring Innovation“. And it really had a part of that. I remember a guy talking about a method to use vegetal cells into skin to produce oxygen and have a better skin after injuries (not ugly scars). The skin was green for a while (because of the vegetal cells). The project was called HULK. Brilliant! I also remember about Alfredo Zolezzi, who was developing a machine to produce fresh drinkable water using plasma. I could not imagine a better use of plasma. That’s a lot of innovation and it was made by chileans. The americans did not bad either. I was touched by the work of Hugh Herr, professor from the Media Lab who lost both of his legs, and he was using all of his resources and passion to build the best bionic legs to people who had lost them. He even made a bionic leg to a dancing girl (Adrianne Haslet-Davis) who lost one of her leg because of Boston Attack in 2013. How could you not being inspired? When Encuentros2013 finished, I felt disappointed. Why? Because, why do we need inspiration and innovation anyways? I mean, there always been great and brilliant people working together in other places and time, but it doesn’t seem to be improving that much. What problems are we solving with inspiration and innovation?. Why are still 3.1 million children dying every year because of bad nutrition? Why, with all the technology that can handle vast amount of resources efficiently, there is increasing economic inequality? How is that US bailout was in order of trillions of dollars, and to eradicate the hunger from the world, it would take just some billions? Why is that it has been more than four decades since the “Limits to Growth” where Donella Meadows, Jorgen Randers and Dennis Meadows, explicitly stated physical limits of resources exploitation that our world could handle and, we just passed them? We are over the limits since the 80’s! The outcome of overshoots were clear; the more we get over the limits, the more we’ll struggle going down the limits. This just doesn’t make sense. Can’t we, with all our developed tools, give a better life to most of the people? Can’t we give a better life to people who can not pay for it? By the way, why is this so important? why is so important to give the best opportunities to most of the people? Because we are facing HUGE problems, and we need all of our power to solve them. Because that’s how we solve big problems; dividing them in small ones that we could handle. That’s the power of society. With society we can solve problems that we can not solve by ourselves. That’s why. That’s why this is so important. That’s why we need to give better life to most of the people; we need all of the human resources to avoid diminishing life quality as we know it. This is what the MIT Media Lab should work on; the Media Lab should work on solving the huge problems that mankind faces. The Media Lab has the unique opportunity to use all the actual technologies, even create new technology, to solve the huge problems. The Media Lab has an unique mix of talented and diverse people who could give us the tools we really need right now. Could we use new technology to address old problems? With the right media we could channel our efforts and help us. We need us. We need the right media.